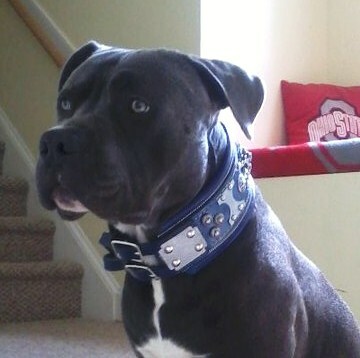 This Blue Shiku Collar. Shiku means lion's roar in Japanese, and a name that I will label this collar with. This collar is approximately 3.5 inches wide with the rolled leather edging, and 2.25 inches on the inner stitched leather. This is a double ply leather collar, as is all my collars, and is approximately 24 oz of leather or over 1/2 inches leather thickness.